For years my mother asked me to read Auntie Gert’s memoirs. I knew that the wrinkled woman with a cane who we visited once a year had been a militant suffragette fighting for the right of women to vote. But that era seemed so distant, so unrelated to me. Auntie Gert died in 1977. When I finally read her memoirs ten years later, complete with photographs and her own sketches, her story changed my life. Personally, Gert became a beacon to light my feminism and social activism. Professionally, I became committed to telling the world this little-known story of the fight for the female vote. The violent revolt by British women less than a hundred years ago is without precedent, yet it continues to be treated without prestige. Gert Harding is born in 1889 on her parents’ farm in New Brunswick, Canada, youngest of six. One simple sketch shows a girl galloping across the field on Old Barney the workhorse, with nothing but a halter and rope. 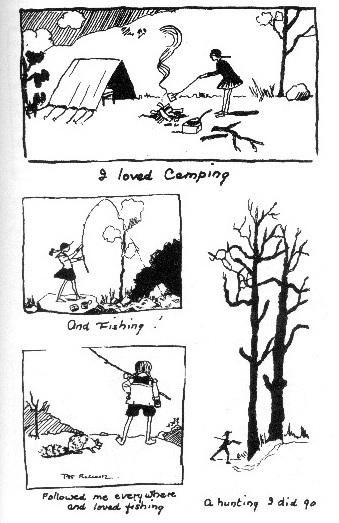 Gert goes camping in the woods alone; she prefers fishing to sewing and hunting to housework. When she is 18 her mother dies, leaving Gert to do all the cooking and housework, with no indoor plumbing, hot or cold. 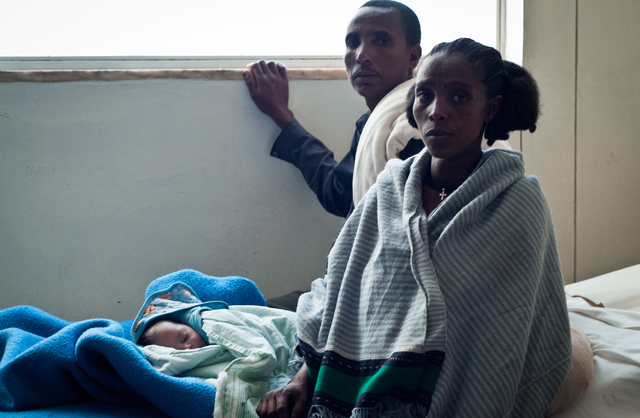 Discovery of a heart murmur turns into a godsend. As such conditions are considered risky in those days, Gert is sent to Hawaii to be companion to her sister Nellie, who has married wealthy Dr. Ernest Waterhouse. Clapham is a miserable sordid suburb of London and a poster parade of women supplied delightful entertainment to the sadistic-minded men and youths lounging on street corners. From fruit and vegetable vendors they would select the most luscious of overripe plums, tomatoes and apples to hurl at us as we plodded along in the rain trying to be oblivious to all that went on around us. Being the last in line, I was a prime target and received a perfect barrage of these unsavoury objects. Then, without thinking, I did the one thing sure to bring on disaster – I raised my umbrella! With loud guffaws of joy the onlookers armed themselves with fresh ammunition and made a bulls-eye every time. Too late I realized the stupidity of my would-be humourous gesture and hastily put down the battered umbrella. Having shown her pluck, Gert is asked to join up as one of only 75 paid workers in this organization of thousands. Her six siblings, spread out now from New Brunswick to Malaya, are horrified. Joining any of the dozens of women’s suffrage groups is shameful, but to work for the notorious Pankhursts and their lot — one of only two groups that condone militancy — is scandalous. As Gert joins, the WSPU has just started its ‘campaign of terror’ against property. Women terrorists? How did that happen? Since 1867, British suffrage groups have been asking the Government to grant women the basic right in a democracy … and getting nowhere. You can put up with injustice and deception for only so many decades. In the early 1900s, legal tactics had escalated to noisy demonstrations and window-breaking, both in protest and to try to get media attention for the cause. When they were jailed as common criminals, instead of as the political prisoners they were, many militants began to hunger strike in protest. The Government’s response was, and still is in 1912, the degrading and painful torture of forced feeding. Acting on their own initiative, a few extreme devotees decide to up the level of violence even further than attacking public art and gardens. They start to bomb and burn empty buildings. Lilian Lenton returns to Kew Gardens alone and torches the empty Tea Pavilion. Such tactics were and are still used by men fighting for the vote, but with many deaths. The suffragettes ensure that they never harm ‘so much as a canary in a cage’. A feminine form of violent protest, if ever there was one. The raid on Kew Gardens is Gert’s only act of violence. (She doesn’t say why.) She next joins the staff of the newspaper, The Suffragette, recently raided by Scotland Yard and driven underground. Gert and her colleagues travel through back alleys with soot on their faces to avoid detection. They set up the type and crank the printing press all night in secret flats, always on the lookout for spies and detectives. Mrs. Pankhurst, who formed the WSPU with her brilliant daughter Christabel, travels far and wide giving rousing speeches, and by now she is the most recognized woman in the world. Each time Mrs. Pankhurst is imprisoned, she hunger strikes and is released. (The Government doesn’t dare force feed this renowned leader, wife of a former Member of Parliament.) 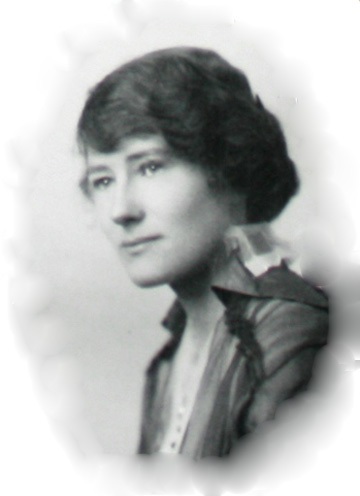 When Scotland Yard is given the special unconstitutional power to re-arrest Mrs. Pankhurst on sight, the WSPU decides to form a secret bodyguard of women to prevent her constant re-arrest while pubic speaking. The Pankhursts consider Gert, the colonial from Canada, to be so resourceful and daring that they choose her to head up this bodyguard. 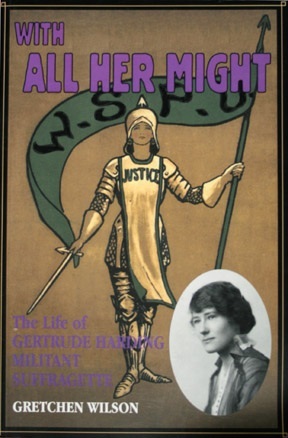 Gert is one of only a few Canadians to join the WSPU. It had been advertised that [Mrs. Pankhurst] would speak on a certain evening, and when the time arrived a huge crowd was waiting, and so were dozens of plain clothes detectives determined to arrest her. 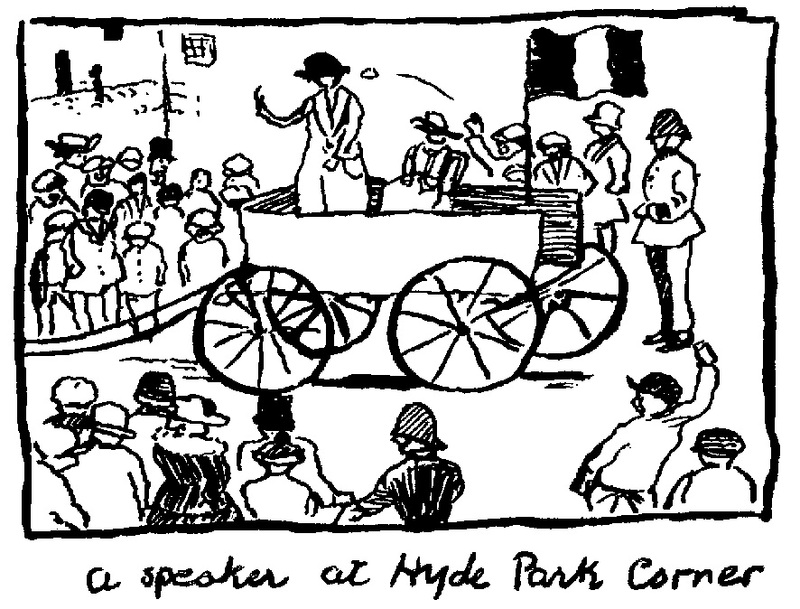 Mrs. Pankhurst… made her speech, and then announced that she was coming down…. A veiled woman closely guarded by a group of the bodyguard was pounced upon by the eager police and spirited away after a token fight. Immediately afterward Mrs. Pankhurst quietly walked down the steps and I escorted her to a waiting taxi. Sharp wits beat strength several more times, always with humourous results. Gert and the other organizers are wanted criminals, but they enjoy going about decked in costumes and wigs supplied by the Actresses’ Franchise League. For most of these women, their years as political protesters will be their happiest and most rewarding. The string of bodyguard successes ends at a suffrage rally in Glasgow in 1914. Hundreds of police storm the hall and overwhelm the combined English and Scottish bodyguard. It was a fantastic scene of violence, with Mrs. Pankhurst in the midst of milling police and bodyguard trying to protect her from injury…. [T]he audience now began to join in with shouts of disapproval against the police. The elderly ladies (who had no use for Suffragettes) rose up in their boxes and, using umbrellas as weapons, began hammering on the heads of two policemen trying to climb on the platform with the help of the “garlands” strung across the front. They let go in a hurry however when the barbed wire [hidden in the garlands] came to light. The speaker’s table was overturned, and chairs flew about in all directions. I found myself looking up at a very large policeman with truncheon lifted ready to descend on my head. For some unknown reason he lowered it and tossed me instead into a pile of overturned chairs. Many of the bodyguard had been struck on the head, and some were found later on to have suffered slight concussion. A brave and wonderful fight was put up by these women. Mrs. Pankhurst is again imprisoned, the bodyguard dispirited. Back in London, Gert soon becomes editor of The Suffragette, as the senior staff is all in prison. It is July 1914. Within a month, World War I breaks out. The Pankhursts make the controversial decision to cease protest and to help with the War effort. 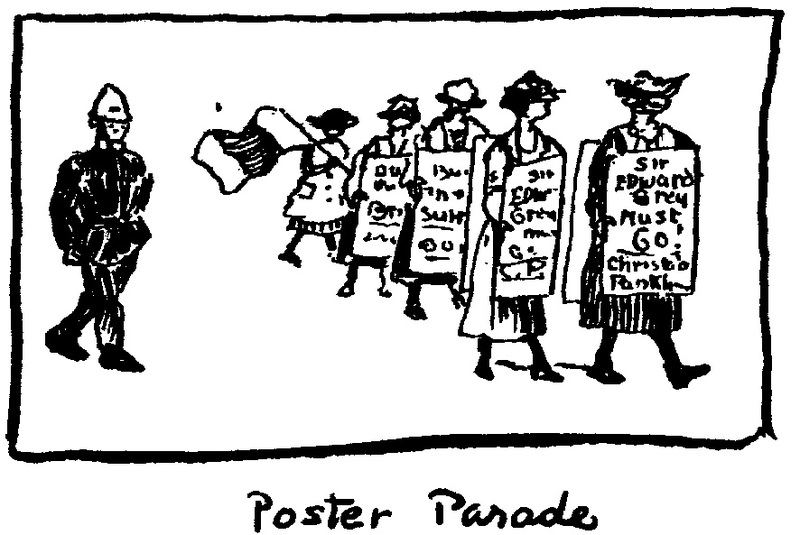 Many women leave for other suffragist groups that continue to fight for the vote. The WSPU scales down but keeps Gert on staff. Christabel Pankhurst, the brains of the organization, moves to Paris to monitor events, and Gert accepts the job of being her private secretary there. Eventually funds are low and even Gert must be let go. With recommendation from the Pankhursts, now the Government’s allies, Gert is hired on at the huge Gretna Munitions Factory as a Welfare Supervisor to the women workers. She proves exceptional at this job, the precursor to our modern Social Worker. When War ends, the British Government finally grants women a partial vote in 1918, in response not only to their war effort but also to the Pankhursts’ threat that if the vote is not granted, militancy will resume. In 1920, Gert moves back home to the new Harding farm in Hammond River, New Brunswick. After a year, she lands a position as Welfare Supervisor in Plainfield, New Jersey, a job she keeps for 13 years. Gert Harding’s biography, published under the author’s married name. In her middle years, Gert continues to volunteer with many organizations, fighting for peace, women’s rights, animal rights and the poor. She keeps in touch with her nieces and nephews in New Brunswick and returns there to live in 1976, where she dies of cancer a year later, aged 88. I was so taken with Gert’s story that I immediately found a Canadian publisher, Goose Lane Editions, and began to write her biography. Researching in London, my Irish assistant, Emily Cargan, and I visited her haunts. We found the glass houses with rare orchids at Kew Gardens and imagined where she and Lilian might have hidden at closing time to await their midnight attack. In museums, we read other firsthand accounts of militants, most of them young, scared and fiercely committed to gender equality. They use the word ‘feminist’, by times, and felt the injustice of being denied the vote as strongly as we would today, were we to suddenly lose that right. If I had been with them, I might have hammered some windows, too. Here is the single fact that drove home how recent is this history: The WSPU formed in 1903 — the year my father was born. Wow. So Dad was in fourth grade in Maryland when Gert was being mobbed in Hyde Park. He was picking peaches on the family farm when she attended the funeral of Emily Wilding Davison, the renegade suffragette who died trying to tie a WSPU flag to the King’s horse on Derby Day. In fact, on the day of Emily’s funeral, when 6000 suffragists were following the hearse, Gert was in hiding with Mrs. Pankhust. The parade suddenly stopped at Westminster Mansions. “Mrs. P” emerged, gave Gert her handwritten press release and was quickly nabbed by police. This incident triggered the formation of the bodyguard. As I researched Gert’s militant days, I kept seeing her and her colleagues committing their acts of daring on a big screen in my mind. Where are the movies about women heroines, women with a political story to tell? Women who, rather than being girlfriend to the hero, helped change the world themselves? I crave such movies, such stories. So the day I mailed off my manuscript to Goose Lane, I began to write a screenplay called Hardie (Gert’s nickname), based on her most exciting 18 months in London. Hardie went on to win an Atlantic Canadian script competition. In 2018, it will be the centenary of British and Canadian women getting the vote (2020 in the USA). Before then I hope to find producers for Hardie. This farm girl from New Brunswick happened to be in the right place and time to seize an opportunity to join the most radical group of women the world has ever known. Viewers will relate to her, shake their fists with her at those who oppose political equality. We’ll feel the humiliation of having rotten eggs thrown at us and we’ll laugh with the bodyguard at the blundering of Scotland Yard. In August I was thrilled to find a New Brunswick producer who loves Gert’s story and wants to make a documentary about her. Now I need to find producers for my screenplay Hardie. I would appreciate any help with this. Gert’s tale has it all: comedy, drama, action, heroes and villains, disguises and subterfuge — even government torture. This fascinating chapter in history is rarely told; this spirited heroine is little-known. Hardie will change all that. Gretchen Kelbaugh has won regional and national screenwriting competitions. Her teleplay “106 Fire Hydrants” was produced for CBC-TV in 1999. Since then, Gretchen has produced independent documentaries and dramas that have screened around the world. Gretchen’s screenplay Margaret and Deirdre won the CBC Producers’ Showcase. She then directed this as an ultra-low budget movie, which won Best Screenplay at the Trail Dance Film Festival in 2008. Piece o’ Cake won Best No Budget Short at the Broad Humor Film Festival. Menocracy (featuring Rt. Hon. Kim Campbell) on women, politics and electoral reform, was recently picked up by Moving Images Distribution. A Film by J.B. Ghuman Jr.
“Spork,” played by Savannah Stelin, is a 14 year old girl trying to fit in and survive junior high. She has a lot of things stacked up against her. And let’s be honest, junior high isn’t exactly a walk in the park. She’s a hermaphrodite (the reason she is called Spork), has crazy ratty hair, is a social outcast, and to top it off the mean girls are out to get her. She’s also being raised by her brother in a rundown trailer, and her mom is buried in the backyard because they couldn’t afford a proper burial. Fortunately, Spork gets some help from her neighbor, “Tootsie Roll” (the hilarious Sydney Park), who tries to teach her some booty boppin’ dance moves. They get a little creative with the help of the classic game twister. First, and foremost, I was sucked into the movie by the awesome music. I was transported back in time to a little dance club in our dinky Wisconsin town when I heard “Tootsie Roll.” There are some fun dance scenes as well. The movie revolves around a dance competition that Tootsie Roll is sure to win until she injures her ankle. She wants Spork to win so they devise a plan to get her to learn some dance moves. Betsy Beyotch and her posse are her main competition and are after Spork for rearranging Betsy’s nose with a basketball. I’m sure most of you have dealt with some Grade A Beyotches. And luckily for us they usually get what is coming to them. Check out the Spork website here. Follow the film on Twitter @SporkMovie and Facebook at /SporktheMovie. Lotus Wollschlager is the official Her Film movie reviewer. Find her bio on the HF.Reviews page. Muslim preacher Houda Al-Habash teaches women and girls the Quran at her mosque in Damascus, Syria, something she’s been doing for 30 years. This is the story of “The Light in Her Eyes,” a new documentary film from Julia Meltzer and Laura Nix. The film will be screening on September 19 in Austin, Texas, and will have several other screenings around the country this fall. Take a look at the Screenings & Events page on the film’s website for dates, times and locations, or to host a screening yourself. I missed the film’s premiere, unfortunately, as I was out of the country most of July. Maybe some of you caught it on PBS on July 19? If not, you can watch a trailer below, or just catch a screening in your town! Check out an interview with Meltzer and Nix in The Austin Chronicle by clicking here. Follow the film on twitter @lightinhereyes. Read more about the film on the official website.